"We are stoked to premiere the song Castles In The Snow from the upcoming album Decennium. This is one of our favorite cuts from the new album and hope it will be for too! Be sure to learn the song and sing along with us on our upcoming tour dates in May and June!" 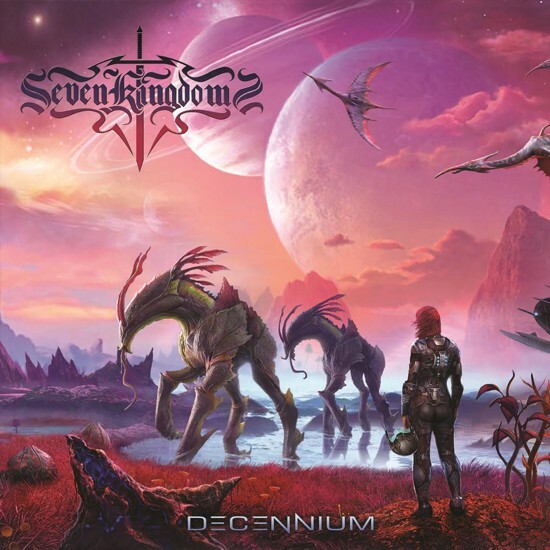 Florida power metal act SEVEN KINGDOMS have recently signed to Napalm Records and are now ready to unveil the track listing, release date and cover artwork for their forthcoming Full Length album and Napalm Records debut, Decennium. A band started for fun, found that hard work and dedication to their craft has major pay offs... SEVEN KINGDOMS is carving its own path in metal history creating something genuinely unique, yet undeniably Power Metal! Decennium will be released worldwide via Napalm Records on May 5th 2017! Decennium was recorded with Jim Morris (Iced Earth, Savatage, Death) and Phil Pluskota (Abiotic, King Conquer) at North Avenue Studios and Morrisound Recording. SEVEN KINGDOMS mixed the album at Morrisound Recording and was mastered by Jacob Hansen (Avantasia, Evergrey, Volbeat). "We are very excited to start the Pre-Orders for the Official Worldwide Release of Decennium via Napalm Records. We are very, very happy with this album and it is undeniably the best product the band has put fourth yet. Napalm ensures that a significant amount of people overseas will get a chance to get the record now without the incredible shipping prices, and also we are excited to finally bring Digital and Streaming platforms to the fold thanks to Napalm. We are very excited for what all of this new stuff brings! Please Pre-Order the record and tell your friends to do the same! See you on tour with Evergrey in about 6 weeks! Get your tickets for the North American dates!"